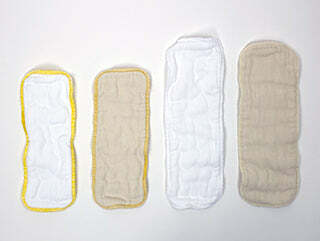 8-Ply cotton diaper doublers made from prefold diaper fabric. Sold individually, or save when buying in packages of 12. The same lovely prefold fabric as our beloved Cloth-eez® prefolds in a doubler sizes. Chlorine-free, optical brightener-free white cotton. Both sizes are 8 layers (8-ply) of 100% cotton. I love the prefold fabric because it's so soft and pliable. It is quilty just like prefolds are so they come out of the dryer curly and need to be flattened out by hand a bit. This is the nature of the twill prefold fabric. I like to match fabrics. This prefold fabric washes very easily and doesn't hold stink because it is 100% cotton. And best of of all, they are very inexpensive. Doublers add additional absorbency in any style diaper. You can fit the size small into any size Workhorse diaper or any diaper. 100% cotton exclusive of trim. Made in the Pakistan. Stack of large white doublers. A cotton doubler is such a simple thing that makes such a big difference in stopping leaks. Large doublers for night time! We use the birdseye large organic flats and I use two of these doublers with a flat at night for our heavy wetter! We have only had one leak and that was my husband's error! And they dry almost as fast as the flats! No staining and smell free! I bought 2 to try. I like them. They work great for extra absorbing. Not bulky at all. Wash and dry very nice. The doublers really help keep my heavy wetter from leaking through every 30 min! Love them! Great product, perfect for helping our leaky cloth diapers! I bought these when my daughter started sleeping through the night. We were sleep training her, and she kept waking up around 4 and had wet through her clothes and swaddling blanket. Once I started adding these to her diapers at night (as well as at nap time) she made it through the night! I usually add 2 at night just in case, and I've never had a problem. I was very impressed with the absorbency and quality! Very happy with my purchase!